tech leaders work with us. Not ready to apply? Keep in touch with Veeam. We are the best employer for those who love to win! Every day, we’re building a work place that’s not just amazing, it’s Veeamazing! We’re always learning something new, developing and making things happen. We’re striving for Greatness every day and we’re ALL IN going beyond availability. We’re innovative, fast and very successful. Run this video to see our team. Veeam is the global leader in Intelligent Data Management for the Hyper-Available Enterprise. Veeam Romania was founded in 2015. In 3 years, our team has grown to more than 400 professionals managing the end-to-end sales process, global and regional marketing activities and technical support. We are the second largest Sales and Marketing hub, with a technical component, for Veeam Software globally. Now we are looking for colleagues who want to develop their career in end-to-end sales, technical support, marketing, finance. For freedom of choice when it comes to what powers you every day. for you and your close ones: Because “healthy” means “happy”. Something to make you smile. Room to grow, suited to your needs. We’ve got you covered when it comes to getting about town. Stay in shape for top performance! So you don’t sweat the small stuff. Take a break to re-charge your batteries! Because sometimes you need to take your mind off problems… to find creative solutions. To turn any sour day sweet in a blink of an eye. Take a fresh and healthy bite to fill up on vitamins! Have a look at our flagship office in Bucharest. See what the working and relaxation areas look like and get immersed in our colorful and positive spirit. In Veeam, there’s a lot of discovery and opportunity for personal and team growth. My work lets me manifest my creative and inquisitive side, because it allows me to take part in interesting projects and stay in contact with major IT companies all around the world. 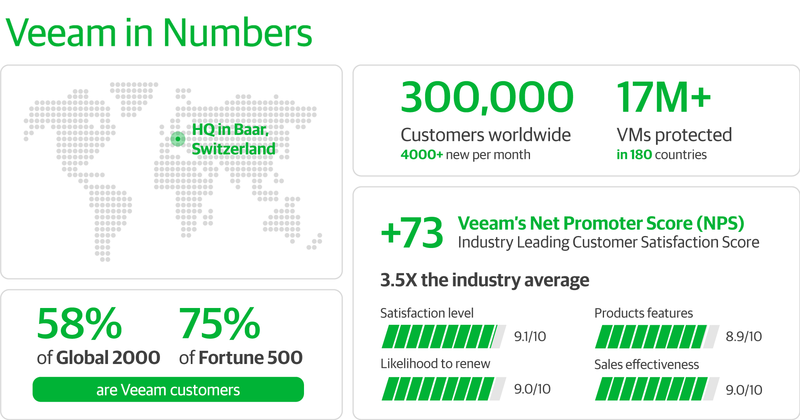 Veeam is a multinational company that still breathes the air of a startup. It's a world of opportunities only a young company can provide. You never fell anonymous, because your contribution matters and your work will not pass unnoticed. And you are fortunate to be surrounded by professionals to learn from and be successful with. Basically working for Veeam makes you better at what you do while being in an excellent company. I'm part of a young team full of energy, who is not afraid of new challenges. Veeam is the best place for me to grow and develop. Working at Veeam is a never-ending experience of learning: learning how to work in a team and learning how to grow exponentially. Best place for self-development. I love my job, the technology, projects and the challenges that I face daily. I've started as a support engineer, then took the opportunity to shift to management. As you can see, Veeam gives each of us a great opportunity to grow. Veeam is a great workplace that unites enthusiastic professionals and gives them a great opportunity to collaborate. I enjoy the the chance to communicate with customers from different countries in several languages. Veeam is a fun workplace with young people and offers lots of opportunities. You always get rewarded for your hard work. Veeam is a multicultural, active hub of wonderful people creating greatness every day. I joined the team last year and I have found myself in a rollercoaster of fun and professional development. Veeam is history in the making at our own speed. Keep the pace, join the movement!